In my newest little eBook, I have a chapter called: "The School Bus Situation: Because every year there is indeed 'a school bus situation'." This is no exaggeration. My triplets are just starting sixth grade. The first week of school is always that adjustment period. Teachers are getting to know the kids. Kids are getting to know the teachers. Where do we sit? What time is lunch? Now that they're in middle school there's even more to get used to: Where's my locker? How do I get to my next class? What time does the bell ring? And this period of adjustment extends to the bus drivers. Where's the stop? Who's at the bus stop? What's the bus route? The only difference is: By the end of the first two weeks, teachers and kids have pretty much settled in... and "the school bus situation" is just getting revved up. As for why we don't want to pick them up: Let me sum it up this way: My kids can't keep from killing each other in a 2-story, 9 room house. How do you think it's going to go on a twenty minute ride in a compact car? And knowing my kids, they wouldn't be deterred from slamming doors just because they'd have to jump out of a moving vehicle first to do it. Not that the back seat brawl is a bad experience for my husband and me. The radio volume goes up just high enough to drown them out. Now that you see things my way.... back to "the school bus situation". This year the kids have to cross over a pretty busy road during rush hour to board their bus. Most parents either let their kids walk to the bus stop alone or they drive to the bus stop a block away and never leave the vehicle. It seems a tad lazy to me, but I'm used to walking miles around NYC so what do I know? I, on the other hand, not only stand there with my kids, but when the bus starts blinking its lights, I inch myself into the intersection so that any vehicle attempting to ignore the lights will have to mow down the little Jewess blocking the roadway to get past. If a vehicle somehow whisks by me, I squint to read the license plate as well as the bumper stickers so I can fully appreciate their intentions. The first week, we had different bus drivers arriving at different times. The second week, one woman, Kim, proclaimed that she would be our regular driver. On Friday of the second week, my kids stated that Kim had announced that she would be on vacation next week. Vacation? What the hell? Does she need a rest? She's only driven the bus 6 times. The route is one big loop. Did she get dizzy spells from going in a circle and have to lie down for a week? In my illustrious 35 year career of day jobs, I never remember taking a vacation on the third week. Just like when you hear on the news that someone is accused of doing something heinous and they get "suspended with pay". What? You get paid for staying home and watching Monk reruns? How's that a punishment? And more important... Where do I apply? It's available on all Amazons + Free download @ Kindle Library. The first day of middle school, the triplets were asked to stand up and tell a little about themselves. My daughter got up there: "My name is Carly Fox. I'm a triplet. I hate being a triplet." She was heading back to her seat when she turned around. "Oh, and I also hate my last name." Way to go on the positive self-talk, Carly. I looked up the number for the school psychologist and added it to my phone contacts so I'd know it when it came up. Maybe I should have been one of those mothers who verbally assaults their kid by yelling:"Good Job!" every three seconds from birth through masters degree. So, I told Carly to feel free to revert "Fox" back to my husband's original family name: "Fuchs". And being from New York, I had no trouble giving her several specific examples of how that could go terribly awry at every middle school in the nation. As for the triplet thing, I told her that we hadn't really entertained the thought of reducing the number of embryos, and that now it was kind of late: The cut-off to make that decision was third grade. While I dislike what she said up there for twenty-two or three reasons, I totally understand. When triplets attend a new camp or school or anything, it's different than one child. When you introduce triplets, it's like the circus side show has come to town. Everybody's staring and trying not to look shocked. It's funny how students and campers seem to get over the novelty and forget all about it a lot faster than teachers and counselors. The girls don't look thaaat much alike: They have different colored eyes and one wears glasses. And not only don't they dress alike, you can tell just by looking at them that they're whole dressing methodology couldn't be more different: One tries on six different outfits in her room, running into the bathroom each time to look in the bathroom mirror, then runs downstairs to get the whole effect in the full-length mirror. She's practicing for the track team, without even knowing it. The other daughter puts on a t-shirt and leggings at night and calls it pajamas. Then in the morning: "Hayley! It's time to get up and get dressed! She rolls over in bed, eyes still closed: "I am dressed!" "Here come the Fox triplets!" like they're one big kid. "What does the Fox say?!" Yeah it was hilarious the first, second, thirty-fourth, fifty-second... okay it was never hilarious. They also get: "Who let the Foxes out? Who? Whooo?!" I keep trying to remind the kids that these people mean no harm. Still, as mother of this skulk of Foxes, I'm always tempted to get nose to nose with the wiseacre and say: "Who let the idiot out? Who? Whooo?" Thanks a lot for stopping by. I hope you were able to add a few laughs to your day. If you'd like more laughs at my/your kids' expense, please sign onto my monthly newsletter and/or check-out my eBook, specifically for parents at this time of year. Available on all Amazons-- Now available at the Kindle Library too. Last week I discussed how slow-moving we are in this house when it comes to getting things done. I mentioned that when we picked this 4+ bedroom house ten years ago, we had specifically done so, so that each of my triplets could eventually have his or her own room, I could have my own office, and that would leave a total of zero rooms available for anyone to ever even consider coming to live with us. My husband Lloyd and I don't really care what relatives think of us as long as they don't think of us as the couple with the spare bedroom. I say 4+ bedrooms because there are four indisputable bedrooms with walls and floors and everything. Then you know how nowadays they give you this unfinished room that you can do whatever you want with like you can put up walls and finish the floor or you can leave it for ten years as a dark, sweltering, stifling sawdust mess? Well, we've toyed with making it into a man cave or office but so far we're still going with the sweltering sawdust mess motif. The first thing she's picked out of a catalog is a $2200 swing chair. That's certainly a fair price for something that's eventually going to make my roof buckle. Do we have the dimensions on that swing? Perhaps we can sell the house and all live in the swing chair. Next is the bed which is up in the air. No I mean literally. She wants to sleep in the top bunk of a bunk bed-- preferably with a canopy. but she's willing to forgo the canopy if it's not possible, because as she stated: "I'm not totally unreasonable." And no, her sister can't sleep in the free bunk. Are you crazy? This isn't about saving space or money or accommodating anyone else you know. The bunk bed just looks cool. Speaking of looking cool, there's going to be an ice cream sandwich bench at the foot of the bed.... and a corner desk because she's going to middle school and she needs that corner desk to do her homework. I agree a middle schooler should have her own desk. I'm not sure why a normal rectangular desk wouldn't promote homework focus as well as a corner one, but apparently it won't. And the room will be painted light turquoise except for the window frames and edges which will be dark turquoise and can we get someone to paint her name on the ceiling? A quick calculation brings this room to about $20,000. I knew I was probably wasting my time, but one day mid-bedroom designing hallucination when she was showing me where she would put her revolving shoe display, I had to finally confront her: "Not to interrupt but: Do you have a top ten hit on the charts that I'm unaware of? Have you been signed to an NBA team? Do you have any idea who your parents are? Haven't you seen me wearing the same pair of jeans your whole life and driving a vehicle that only starts every third try?" To which she responded, predictably: "I've noticed. I just always figured you were saving up for my room." Thanks for stopping by! If you'd like more laughs at my children's expense, please sign on to my newsletter / take a look at my eBook: It's fast, fun summer reading for parents right now: That stressful time between when one school year ends and another begins: "Do we send them to camp? Do we keep them home? Local festivals, pools, bowling... & then prepping for back-to-school and a new year all over again." Please read the eBook. Please, please don't make me go through this alone! When many couples buy their first house, they get something with a bedroom or two not knowing exactly how many children they might end up with and go from there. But since I had just, eight months before, given birth to triplets and told the doctor during the c-section: "So, while you're in there, you might want to tie those up. In fact, make it a double knot just to be sure " and then at my six week check-up: "So, how's it going down there, Doc? Everything still tied nice and tight? ", my husband and I had a pretty good idea of the maximum number of bedrooms we were going to need for at least the next decade or two in our new North Carolina home. "Four" seemed like a good round, even number of bedrooms. This way each child could have his or her own bedroom, my husband and I could be left alone downstairs and all of our relatives whose eyes got wide at the prospect of using us as a Motel 6 on their journey to and from New York and Florida could be met with: "Of course you're welcome! If you don't mind sleeping on the floor of the laundry room." I always had my own room as a kid. Even one that was teeny weeny was still my own. My husband shared a room with his sisters until they were all teenagers. Creepy-sounding yes... but in a NYC apartment... still creepy... but understandable. So our plan upon move-in day was to keep all three babies in bedroom 2. Bedroom 3 would be a play room and bedroom 4 would be my office. Then, when they got a little older, the shift would be on: My one daughter (I dare not call her "daughter 1" especially since she thinks of herself as "daughter 1+") would keep bedroom 1, my son would move into bedroom 2, my other daughter would move into bedroom 3, and we'd finish the unfinished room and I'd pick up my work belongings and head over there. Well, none of this is happening fast enough for daughter 1+. Her brother did move into the play room as planned. One sibling down, one to go. Then progress came to a screeching halt. The delay is totally my fault. (That's daughter 1+ over there nodding in agreement.) The shift can't proceed because we've still, ten years later, never gotten around to finishing that room. My husband and I are the ones single-handedly holding up the shift. I don't know if normal parents of a normal birth's worth of kids have these issues, but as parents of triplets (or maybe it's just us), we're always way behind. If we have to mail in papers for camp in March, by the time we get it together it's June so we just have a kid hand them in when they get there. "Here. My mother said you might need these." It seems to be a pattern with us. They stopped sleeping in cribs with a Disney mobile at five, we toilet trained them at seven, took off their training wheels at ten. They'll be eleven in a few weeks: Is it too soon to start them on solid foods? Does anybody happen to know? 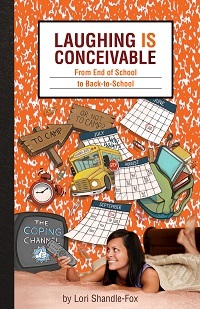 Laughing IS Conceivable: From End of School to Back-to-School (I love my kids. I love my kids. I LOVE MY KIDS!) ... Come de-stress on my journey with the triplets from camp to local activities to back-to-school haircuts, shoe shopping, clothes shopping & doctor appointments.